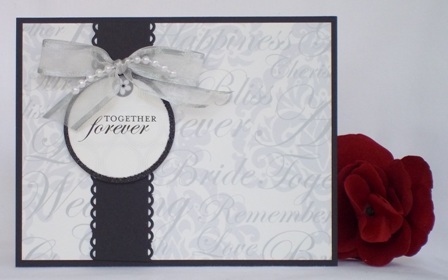 Create handmade wedding greeting cards using black and white colors. Find unique handmade card ideas using a border punch to make a wedding card. Ideas for wedding cards can come from a sketch. I used an ebook called 50 Card Making Sketches for this wedding card idea. The ebook shows different versions of the sketch so I used one of the simpler versions for this home made wedding card. To make this handmade wedding card, start with a black card and adhere a wedding pattern paper over it so that you have a 1/8" border around all four sides. The ebook has detailed instructions and measurements which makes handmade card making projects faster. For lots of my paper card making ideas, I like to use craft punches and used a border punch to create the scalloped finish along the edges of the black paper. Craft punches are a great to tool to have and they allow you to make lots of wedding card designs as well as designs for other occasions. I like to use scrapbook paper kits for many of my homemade greeting card ideas. 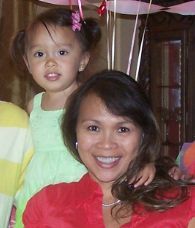 Making wedding cards is easier since everything is color coordinated. 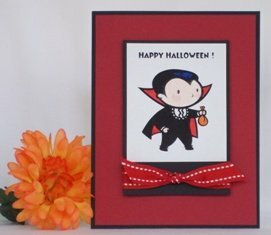 This kit was primarily black and white so for your cardmaking ideas, you can add a third color like red, pink or whatever color you like. The pattern paper and circle sentiment came with the scrapbook kit and I just added black cardstock paper. Also from the kit is a little flower sticker that I added below the ribbon. For this hand made wedding card, I used a sheer white ribbon that had silver on the edges. Pearls are great embellishments for homemade wedding cards and I added a little string over the ribbon. You don't have to make wedding cards only with this card design. 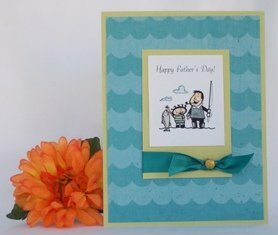 The layout works great for cards for other occasions, just change out the pattern paper and sentiment.